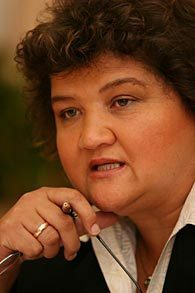 Lynne Brown is a former Premier of the Western Cape province in South Africa. She was born in Cape Town on 26 September, 1961 and grew up in Mitchells Plain. She was appointed to the post following the resignation of Ebrahim Rasool in July 2008. Previously, she was Minister for Economic Development and Tourism. She is a member of the African National Congress. Like her predecessor Ebrahim Rasool she is also from a Coloured background. She is the fourth Coloured premier of the Western Cape, and the second from the African National Congress. The African National Congress (ANC) has been South Africa's governing party, supported by its tripartite alliance with the Congress of South African Trade Unions (COSATU) and the South African Communist Party (SACP), since the establishment of non-racial democracy in April 1994. It defines itself as a "disciplined force of the left". Members founded the organization as the South African Native National Congress (SANNC) on 8 January 1912 in Bloemfontein to increase the rights of the black South African population. John Dube, its first president, and poet and author Sol Plaatje are among its founding members. The organization became the ANC in 1923 and formed a military wing, the Umkhonto we Sizwe (Spear of the Nation) in 1961.